This year is going to be busy -- particularly heading into Spring, but for good reason! ALL THE WRITING! I'm currently 58,000 words into my next book (a non-Greek-myth historical adventure), and counting. Which puts me about 6,000 words behind where I *wanted* to be by the end of this month, but there's time to catch up. Unfortunately, the sacrifice is going to be on the blogging-side of things (in addition to the majority of my social life -- whoops!) So expect updates when I actually have exciting news, but things will be quiet around here until I conquer this monster of a draft! With divine beauty comes dangerous power. Helen believed she could escape her destiny and save her people from utter destruction. After defying her family and betraying her intended husband, she found peace with her beloved Theseus, the king of Athens and son of Poseidon. But peace did not last long. Cruelly separated from Theseus by the gods, and uncertain whether he will live or die, Helen is forced to return to Sparta. In order to avoid marriage to Menelaus, a powerful prince unhinged by desire, Helen assembles an array of suitors to compete for her hand. As the men circle like vultures, Helen dreams again of war—and of a strange prince, meant to steal her away. Every step she takes to protect herself and her people seems to bring destruction nearer. Without Theseus’s strength to support her, can Helen thwart the gods and stop her nightmare from coming to pass? Picking up where HELEN OF SPARTA left off, book two completes Helen's story! 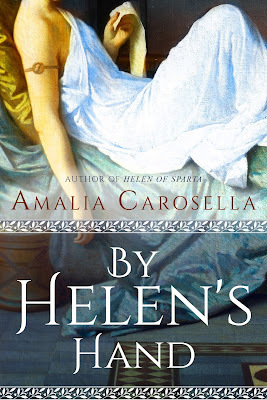 And if by some strange turn of events you have come upon this blog and NOT read HELEN OF SPARTA already -- it's on sale for kindle during January for just 2 dollars (and the paperback is still priced below $9!) so head on over to Amazon and order that copy for yourself (or a friend) while the sale lasts!